Update October 2015: our final home design is similar but different, and you can see the latest here. We finally settled on the Mushroom’s shape & design with the Fez’ colors, the addition of the second floor desk, and a new idea for a room on the roof! 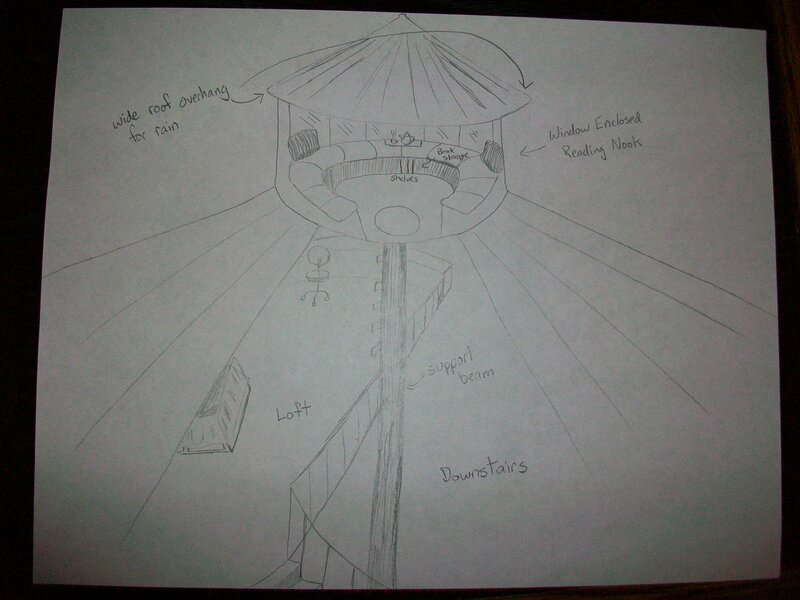 So, it’ll look like the Mushroom with a gazebo on top. Here’s an email from Ryan with a response from the architect (below). Mr. Geiger has been wonderfully responsive and super helpful with our questions about his earth bag home designs. I included a sketch I did while trying to express the kind of thing we wanted from our home. It’s like a combination sleeping porch / gazebo / reading nook / rooftop garden. In this way, we can avoid major leakage in the roof and still be able to let the cats experience chigger & tick-free “outdoor” entertainment, while providing ourselves with a quiet, all-seasons retreat. Yes, you can build an optional loft in the roof. You can create additional loft space with specially designed trusses, raising the wall height, making a steeper pitched roof, all the above, etc. The next step is for you to sketch changes to the floorplans, scan and save as jpeg images and email to me for a fixed quote. What do you think we should call it? Leave your ideas in the comments! Which Home Design Should We Choose? Valentine’s Day Fair Trade Chocolates! Very nice! I think in August especially, the roof at the top of the structure, coupled with open air space beneath, will make the indoor environment below much more habitable! Your design looks like a great blending of two very good ideas. Keep posting on this topic (earth bag building) please, I’m interested in taking one of their workshops in the future – while we have a home, I need a barn, and this looks like a very cool way to build one! Have you guys found a source for the bags yet? We were thinking about using the leftover bags from other earth bag projects in the area, but will probably make that decision next year when we prepare to build. Thanks for the support! An earthbag barn would be great; I heard they’re resistant to fire.